Within history of the United States of America, the Civil War was brutal time period, which divided the nation into two factions: The Union (The North) and The Confederates (The South). Over the course of four years (1861-1865), hundreds of thousands of soldiers (on both sides) were left for dead and the destroyed the South’s infrastructure. With the war won by the Union, the nation went under the “Reconstruction Era” (1863-1877), which dealt with the aftermath of the war and the “reconstruction” of the nation and its society. To this day, the American Civil War remains the bloodiest war in U.S. History to be fought on its soil. Thus, it comes at no surprise that Hollywood (over the years) has created multiple cinematic feature films that showcase the various points of views during the Civil War from the battlefront to the homestead to the courtrooms to the presidential oval office. Which brings us to the present as STX Entertainment and director Gary Ross debut the film Free State of Jones Does this “based on a true story” feature shed new light on the American Civil War or is story that’s meant for the history books and not a cinematic retelling? Barely surviving the years in the Civil War as a medical nurse, Newton Knight (Matthew McConaughey) has experienced his share of tragedy. However, when his teenage nephew gets killed on the battlefield by an enemy combatant, Newton goes AWOL, abandoning his post and heads back to his home to live a life of peace. Unfortunately, his tranquil life of solace is shattered as the Confederacy isn’t ready to let Newton, with General Hood (Thomas Francis Murphy) determined to retrieve the missing soldier. Seeking a hidden refuge in the swamps, Newton befriends a band of runaway slaves such as Rachel (Gugu Mbatha-Raw) and Moses (Mahershala Ali). Realizing that the Confederate Army is taking advantage of local farmers, Newton begins to assemble a rebellion (a mixture of runaway slaves and Confederate deserters) to defend their land and their livelihood. Armed and ready to fight, the rebellion manages to gain some ground, inspiring Newton to think “bigger” than just a rebellion army and more of a community that strives to make a larger point about freedom. Unfortunately, as events unfold, the “winds of change” sweep across the nation and Newton is faced with problems beyond the battlefield. Being a history buff, I do like learning about American History (mostly in the timeframe around the American Revolution). The American Civil War is interesting, but I’m just getting into it, so I don’t know a ton about (with the exception of major events that I learned back in high school). As for movies, I’ve seeing several of the movies that Hollywood as put out during this event, including Edward Zwick’s Glory (great movie btw), Ron Maxwell’s Gettysburg, and Steven Spielberg’s Lincoln just to name a few. I remember seeing the trailers for Free State of Jones and found it interesting with a unique premise, especially since it was based on a true life event that I’ve never heard of. After seeing the movie, I felt that Free State of Jones, while palpable in its storytelling, was more of uneven history lesson that belongs in a classroom and not in cinematic feature. Free State of Jones is directed by Gary Ross, who has previously directed such films as Seabiscuit and The Hunger Games. Like I said above, this movie is interesting because I didn’t know much about this event that happened down in Mississippi, so (from the get-go) Free State of Jones is intriguing to everyone as you (the viewer) are curious to what Newton goes through and from within the movie’s timeframe. Ross, along with Leonard Hartman, write the film’s script / narrative, spreading itself out within large period (more than a decade) and hitting major events for both the character of Newton and significant history events. For sets designs and locales, Ross and his team, including production designer Philip Messina, and director of photography Benoit Delhomme for bring this time world to life on the big screen. From the swamps, plantations, to the rural and undeveloped regions of the south, the movie setting plays a pivot role in the movie believability. Also, after doing some research after the movie, I found out that Ross sought out historical consultants to give Free State of Jones a great sense of authenticity and historical accuracy, which is always a good thing. In addition, Ross doesn’t seem to “romance” the American Civil War in Free State of Jones. Similar to The Hunger Games, Ross paints a very brutal time period that’s full of war and racial tension. The opening salvo for the feature depicts a gruesome Civil War battle that’s depicts many getting shot and killed with horrifying / traumatic wounds to those who survive. Throughout the movie, including the third act, the movie showcases the trying times of African-American slaves and their post-Civil War life underneath President Johnson. It’s hard hitting stuff, but not so much as the raw and unflinching work of Steve McQueen’s 12 Years a Slave. Still, this movie isn’t for the faint of heart, whether grossed out by after-battle wounds or by racial slurs and the depictions of hate-filled acts. While Free State of Jones is palpable, gruesome, and interesting, it can’t escape having problems that weigh the feature down from reaching cinematic greatness. The most notable problem is found in its narration. Free State of Jones has a lot of “ground work” to cover, spanning more than a decade of civil war nuances, character progressions, and racial tensions and uprisings. Even for a two hour plus movie (roughly 139 minutes long), the movie feels bloated at its wants to tackle all these issues and points, but fails to do so, spreading its plot threads and ideas to thin that (ultimately) makes the it all bland and lackadaisical in trying to build momentum for the movie and an engaging narrative. In addition, the movie’s three acts seem to focus one thread and leaves the rest to falter, losing in their struggle and poignancy. The movie evens add a side story involving Davis Knight (Newton’s descendant) is on trial and being prosecuted for his racial heritage. I think it’s a really great idea, but it feels a bit disjointed as the movie keeps flashing back and forth between the two timeframes in a sporadic tone. In truth, I think it could’ve been utilized as an ending narrative (explaining what happened) before the end credits begin to roll. 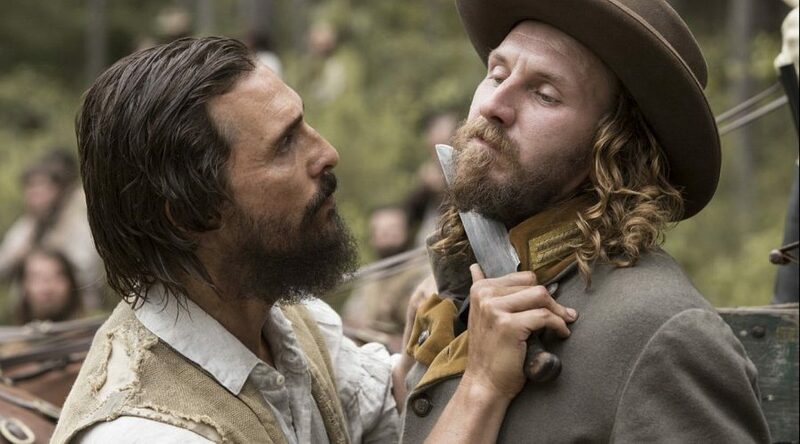 Furthermore, if I’m been honest about the feature, I believe Free State of Jones would be best suited as a TV min-series (production on a premium channel like HBO), allowing all narratives and historical events that are covered within the movie the chance to grow and develop into something more than what was presented. While Free State of Jones struggles to cultivate a strong narration build-up and pacing, the film’s characters (most notably in its supporting roles) are not quite fully realized. Thankfully, most of the main and principle cast are more developed, which do give a more well-roundness to the characters throughout the proceedings. Of course, leading the feature is Oscar-winning actor Matthew McConaughey as Newton Knight. McConaughey certainly does breathes life into this real-life figure (thanks to his performance) as his character goes through a favorable story arc from being a rebel (for his own purposes) to being a leader and fighting for most much bigger than just one man. Likewise, Mahershala Ali and Gugu Mbatha-Raw as the quondam slaves Moses and Rachel deliver fine performance, with each one get their moment to shine on-screen, as their characters evolve from simply surviving / existing during such times to individuals who are driven action by his or her own personal cause. The supporting cast in Free State of Jones includes several recognizable faces (not Hollywood A-listers), but some that are many might know from other film projects. This includes, Keri Russell as Newton’s first wife, Serena, Bill Tangradi as Lt. Barbour, a Confederate lieutenant who (on numerous occasions) battles against Newton and his rebel fighters, Brian Lee Franklin as Newton’s great grandson Davis Knight, and Christopher Berry and Sean Bridgers as Newton’s fellow Confederate soldiers (Jasper Collins and Will Sumrall, both whom join the rebellion. While these supporting characters give fine performances in their acting ability, their characters, on the hand, are so memorable. That’s because the movie itself doesn’t offer their characters don’t grow and flourish and are merely there to propel the story / plot points forward. The brutality of the American Civil War and the horrible ramifications of slavery are expressed in the movie Free State of Jones. Gary Ross’s wartime period drama does indeed shed light on a very interesting and poignant time period in the Civil War and is presented in a well-crafted movie and played by some fine actors and actresses. Unfortunately, the movie feels uneven within its three act arc and lackadaisical, hitting various plot points with documentary precision at various times. To me, it was good, but not super great and was (at times) a bit boring. Because of that, I would say that this movie is best suited as a “rental” as it’s not a “must see” movie to rush to the theaters to see. In truth, Free State of Jones succeeds at bring a “lesser-known” Civil War tale to life, but the film itself feels strenuous under a cinematic lens. A history lessons that’s meant for a college classroom lecture and not a 139-minute movie.